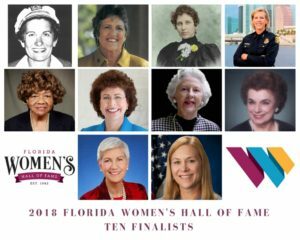 Tallahassee, FL (March 30, 2018) — The ten finalists for the Florida Women’s Hall of Fame chosen by the Florida Commission on the Status of Women have been announced and sent to Governor Rick Scott who will soon select the 2018 inductees into the Florida Women’s Hall of Fame. As is customary, the Governor will select up to three women for induction into the Hall of Fame, which recognizes and honors women who, through their works and lives, have made significant contributions to the improvement of life for women and for all citizens of the state of Florida. The Commission has determined that the following nominees exemplify the great diversity of women’s contributions to Florida life: Doris Mae Barnes, formerly of North Miami; Dr. Judith Ann Bense of Pensacola; Jane Castor of Tampa; Byrd Spilman Dewey formerly of Boynton Beach; Adela Gonzmart formerly of Ybor City; Pam Iorio of Tampa; Lee Bird Leavengood of Tampa; Janet E. Petro of Indian Harbour Beach; Patricia Ann Seitz of Miami; and Geraldine Twine of Tampa. “The Florida Commission on the Status of Women, in the true spirit of celebration, is proud to honor these outstanding women who have had such a meaningful impact on our state and its history,” said Commission Chair Lady Dhyana Ziegler, Ph.D., DCJ. “Each year it is more difficult to choose ten finalists to send to the Governor because of the many superb nominations we receive.” This year marks the thirty-sixth year of the Florida Women’s Hall of Fame. 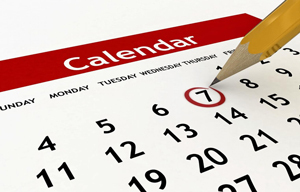 This year’s inductees will be honored at a ceremony on September 26, 2018, in Orlando, Florida, in conjunction with the Florida Chamber Foundation’s 2018 Future of Florida Forum. Learn more about the Florida Women’s Hall of Fame here.